A group of seasoned city developers is closing in on their first project in Manchester. The Monument Cos.’ Chris Johnson and Tom Dickey are teaming up with Howard Kellman of The Edison Co. for an initial $6.5 million redevelopment of the former Muse Buick car dealership property at 1400 Semmes Ave.
They’ve had the property under contract since March and are slated to close on the 2.7-acre site by year-end for an undisclosed amount. It most recently was assessed by the city for about $2.9 million. The development will be a mix of historic rehab and new construction, Johnson said, with some of the existing buildings on the site being converted into market-rate apartment units. The work will occur in phases driven by market demand, Johnson said. Plans call for the initial phase to include 47 one- and two-bedroom apartments, taking about 10 months to a year to complete. 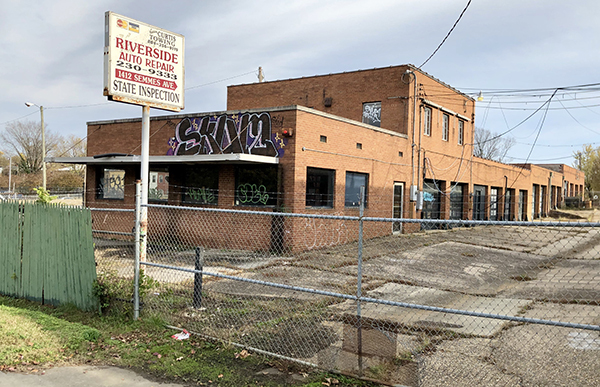 Johnson said the group is mulling ideas about how best to develop much of the vacant surface lots on the site at a later time, which could bring an additional $20 million to $25 million of investment to the site. Development of the Muse property has been a waiting game. Indianapolis-based Herman & Kittle Properties was under contract with the Muse family about a year ago to convert the site into a nearly $50 million, 278-unit apartment development. But the deal fell through, leaving the Muse family, who have owned the property for more than 60 years, seeking another buyer. JLL brokers Jake Servinsky and Jimmy Appich are representing the Muse family. It wasn’t until a proposal was made last spring to expand the Manchester historic neighborhood boundaries that the site was put back in play. The Virginia Department of Historic Resources approved the new boundaries last month, which now include the Muse property. The approvals add nearly 700 buildings to the state register, giving those properties added protections and making them eligible for state historic preservation tax credits. “It makes it more attractive for us to develop the site,” Johnson said. The Monument Cos. and The Edison Co. have worked together on several projects across the city, including the former Signet Bank building that was redeveloped into the 8th & Main apartments at 800 E. Main St. downtown and the former Sunny Men’s Wear building that’s being converted into a mixed-use development at 326 E. Broad St. The same two companies also completed a $45 million rehab of the former GRTC Transit System bus barn and depot into Cary Street Station, which includes 285 apartments and ground-level commercial space. The Muse site sits across the street from where Alabama-based LIV Development is proposing a seven-building, 289-unit community on 15 contiguous parcels totaling about 7.3 acres near the Lee Bridge at 1400 Railroad Ave.
PermitZip is doing the mechanical, electrical and plumbing drawings for the Muse project. 1 Comment on "Former Muse Buick site slated for mixed-use overhaul"